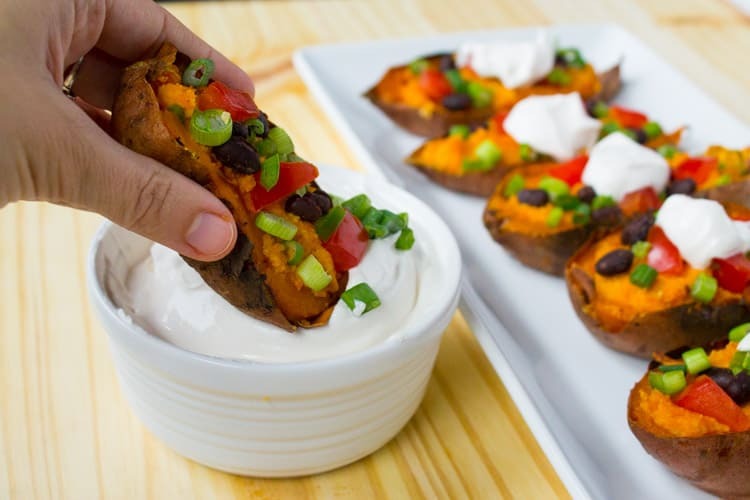 A perfect appetizer for your New Years Eve bash (or the next game day), these vegan loaded sweet potato skins are packed with cashew cheese, beans, tomato & green onion. Am I the only one that thinks New Years Eve is over-hyped? Living in a big city like Boston, ads for NYE parties that come along with a hefty price tag.are constantly thrown in my face. Why pay $300 for a night with mediocre food and a 30-minute line to get a drink at the bar? I don’t get it. Maybe it’s my age talking, but this year, I’d much rather sit down with Steve and close friends and have a relaxing night with good homemade food and drink. And a champagne toast at midnight, obvi. When thinking of an appetizer that would be as colorful as NYE is, I thought of my most popular recipe of 2014, the loaded vegan sweet potato with green goddess dressing. 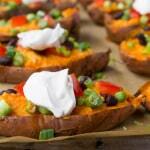 Inspired by the loaded sweet potato, I thought why not make some sweet potato skins? When I was younger and ate meat, I remember really enjoying potato skins (with bacon). 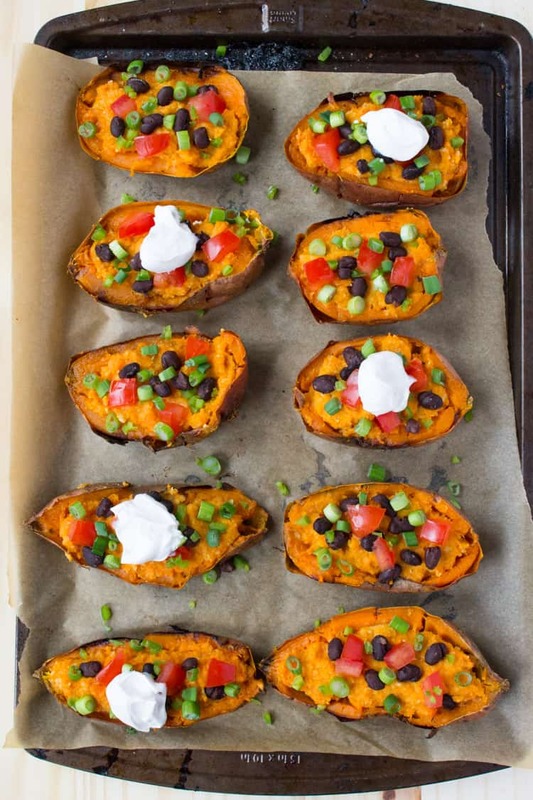 And once I went veg, I couldn’t find vegetarian potato skins on menus for the life of me. 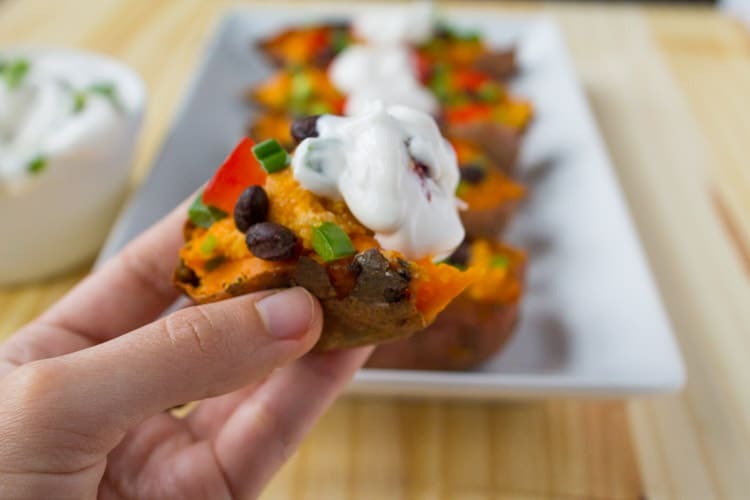 I rarely eat white potatoes these days so I figured I would make my own veg-friendly sweet potato skins, fit for any party, from a NYE bash to a Super Bowl Sunday party! 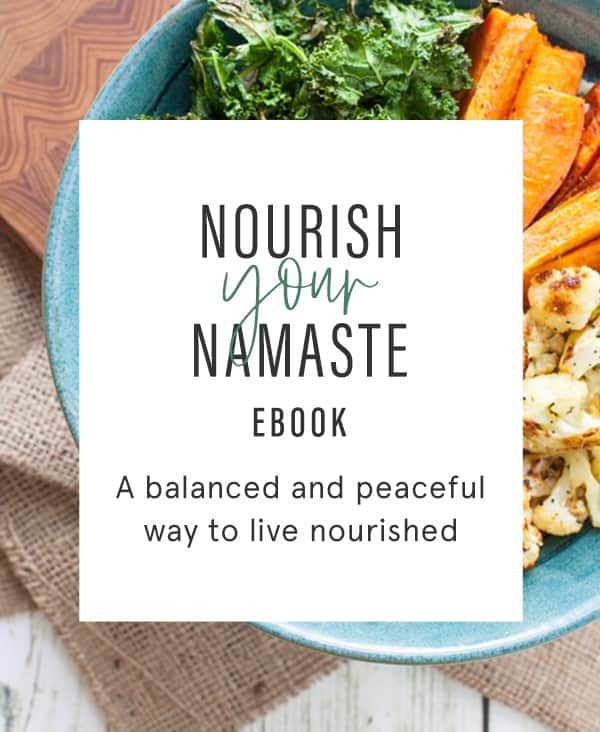 I found these super easy to make and was excited to use cashew cheese in this recipe as it’s a delicious natural vegan alternative for cheese. Making cashew cheese is as easy as saying 1-2-3-food-processor! Seriously, you throw all your ingredients into the food processor, and you’re done! Remove skins from oven and top with beans, tomatoes, jalapeño, and green onions. 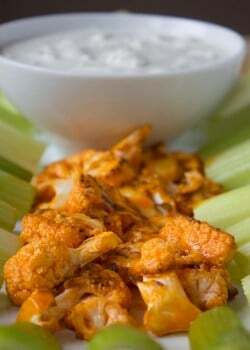 Optional: Serve with vegan sour cream for dipping or dolloping. Cheesy mashed sweet potato goodness with a crispy, crunchy exterior. What more can you ask for? A dollop of vegan sour cream went a long way on these bad boys too. 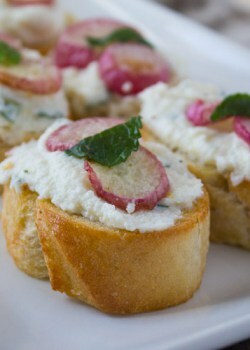 For more NYE appetizer and cocktail ideas, don’t miss my round-up of 31 festive NYE recipes! 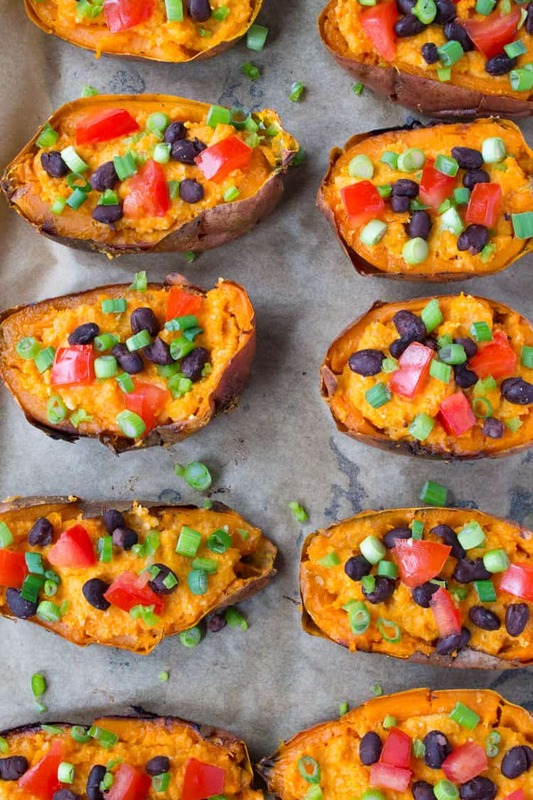 I definitely see these in my future…I love your recipes! Awe! thanks so much, Rachel! This looks too good!!! I will definitely be giving that cashew cream a try!! Hello! Im excited to try these this evening. I was wondering can you omit the nutritional yeast from the recipe? What does it do? Unfortunately I do not have any in the pantry! Hi Helen! The nutritional yeast helps add a cheesy flavor to the potato skins so I wouldn’t recommend omitting it unless you’re okay with dulling down the flavor a bit. These look amazing! 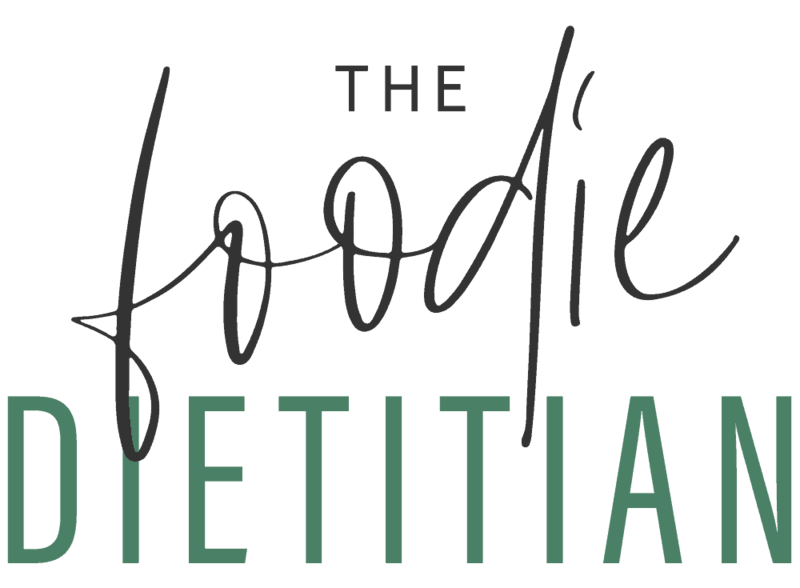 I needed more recipes on my list to try nutritional yeast! Thanks, Emily! It works really well in cashew cheese. Great minds, indeed! Can’t wait to see it. Thanks, Sonali! Cheers to 2015! Those pictures are so vibrant, I’m about to eat my computer! 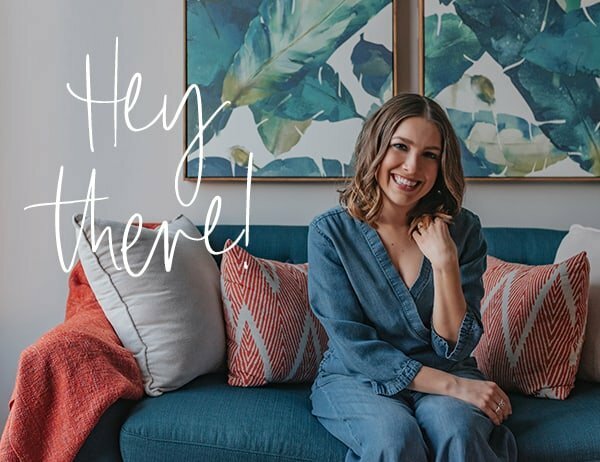 My husband and I are going out for a veryyyy late dinner at a fancy restaurant the city- I’m totally with you on skipping the expensive open bar and crowds! Haha! Sounds lovely – enjoy your dinner date, Jess! Um, I’ll just eat that whole entire pan myself 😉 Yum! Haha. I’ll go halfers with you. These look awesome Kara! 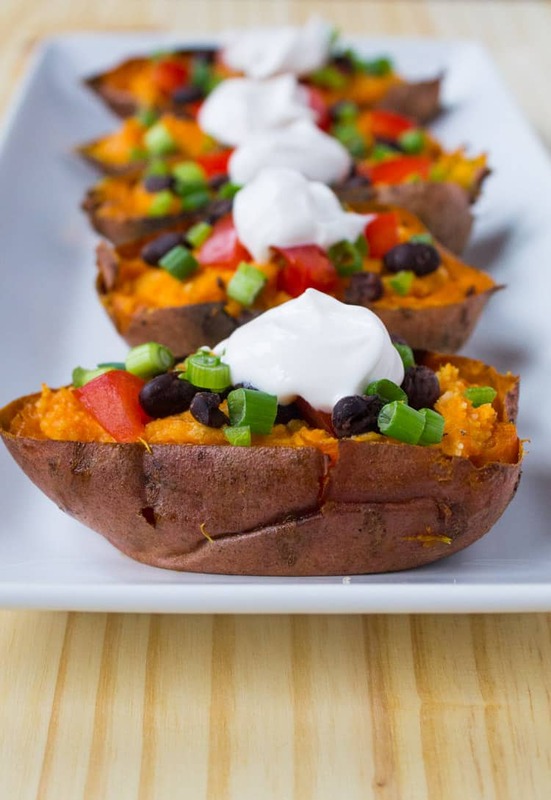 I loved potato skins, and sweet potato skins are even better. I’m with you, NYE is for the youngsters, and I mean newly 21 year olds. Alex is only 22 and she’s over going out on NYE. Have a Happy and Healthy 2015! Thanks, Linda! Happy New Year!! These look really tasty! 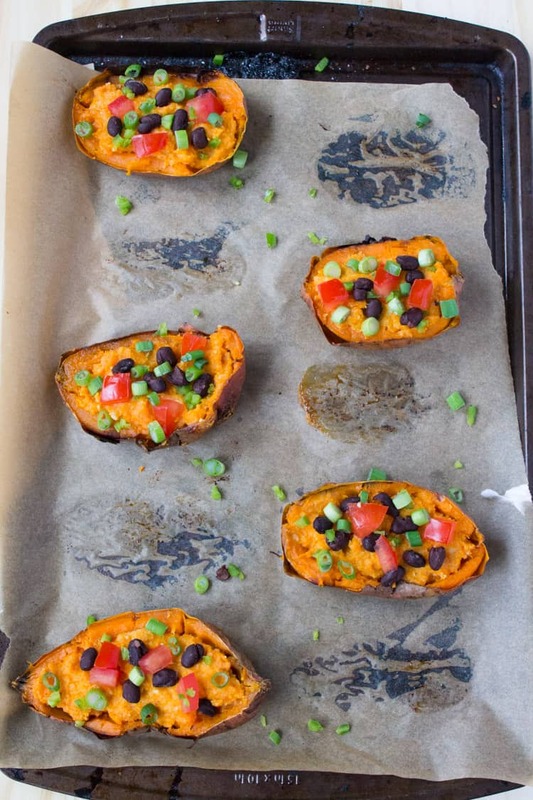 I love sweet potatoes, what a great way to enjoy them!